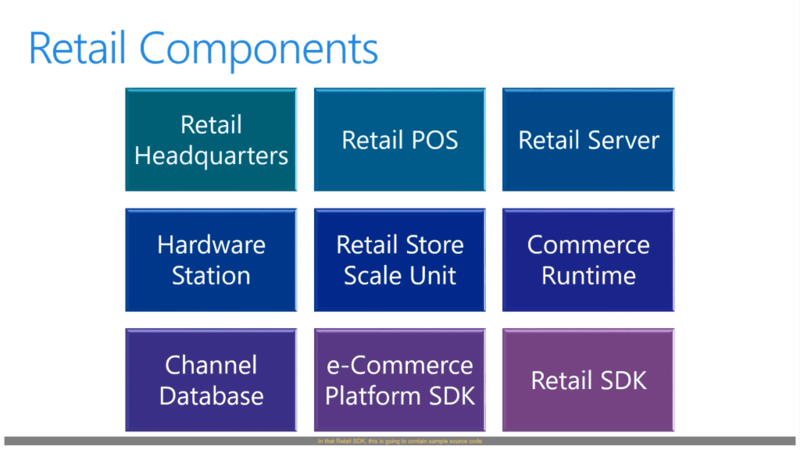 Dynamics 365 Finance and Operations for Retail can be broken up into several components. 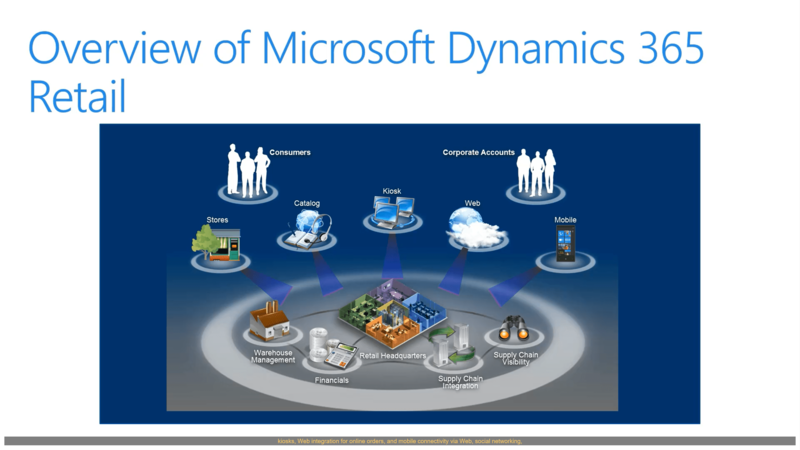 Retail Headquarters for Dynamics 365 Finance and Operations for Retail can be used to manage a chain of stores as one enterprise. It controls daily operations and tracks sales information for every store in the chain. 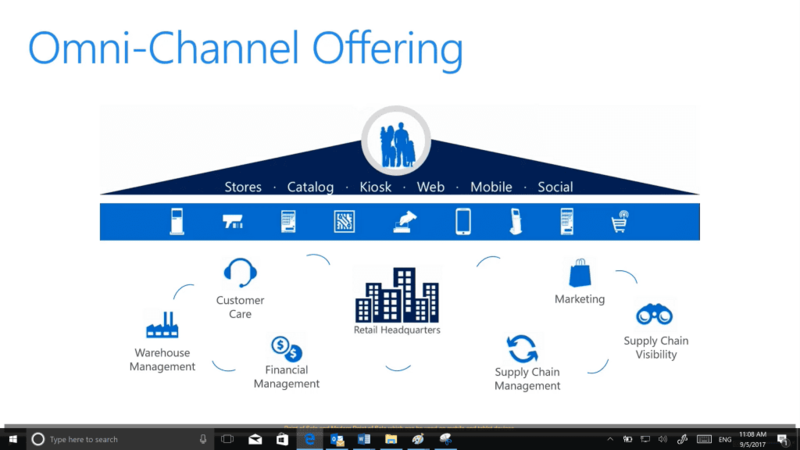 The Retail Scheduler coordinates communication between Dynamics 365 Finance and Operations for Retail and the various stores. The Retail Headquarters can be used with any POS or any online store system that can receive and transmit required data. It's important to note that as far as building a custom POS or online store solution for Dynamics 365 Finance and Operations for Retail, this is going to be a very complex task and it will require extensive planning, development, and testing. Cloud POS (CPOS) – This is a browser-based POS that can be used on mobile devices. Modern POS (MPOS) – This can be used on clients' devices such as PCs, tablets, and phones to process sales transactions, customer orders, and daily operations. We can also perform inventory management too. Retail Server – This is going to provide OData Web API that lets both employees and customers access information and perform tasks by using Retail POS clients along with the online store. Hardware Station – The Retail Hardware Station provides services that enable Retail POS clients and peripherals such as printers, cash drawers, and payment devices to communicate with the Retail Server. Retail Store Scale Unit – The Retail Scale Unit is a set of features that support selling products in a store that do not have constant Internet connectivity to a back office or headquarters. The store scale unit is designed specifically for in-store operation and enables cross-terminal transactions and shift operations even when you're not connected to the back office. Commerce Run Time – sometimes known as CRT, serves as the core engine that supports the business logic across the various channels. Commerce Run Time contains a data access layer along with services layers, workflow layers, and an application programming interface layer. Channel Database – A channel database holds Retail data for one or more Retail channels such as online stores or brick-and-mortar stores. eCommerce Platform SDK – The comprehensive e-commerce platform lets you plug into a front-end online store that can take advantage of the omnichannel services of the platform. The software development kit, also known as the SDK. This also consists of a sample online store that demonstrates how you can take advantage of the platform. Retail SDK – In that Retail SDK, this is going to contain sample source code and templates that we can use to customize the Retail system. The power of Dynamics 365 Finance and Operations for Retail lies in the cohesion of how channels are brought together. 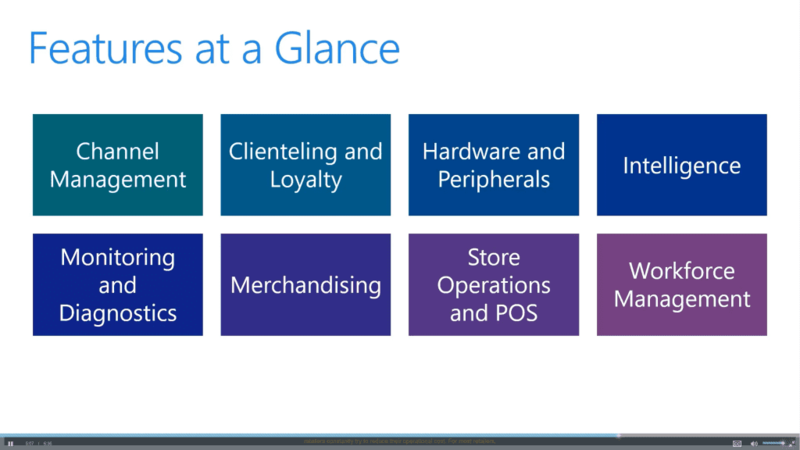 Even though each workspace is intended for a different task, Dynamics 365 Finance and Operations for Retail has cohesion built from the ground up. That is the goal of the omnichannel offering. Microsoft Dynamics 365 Finance and Operations for Retail is an end-to-end solution for mid-size and enterprise retailers that offers multi-channel management, point of sale, store operations, e-commerce, merchandising, enterprise resource planning, some other capabilities and so much more. Unlike retail software built to solve the problems of the past, Dynamics 365 Finance and Operations for Retail delivers powerful, role-tailored, omnichannel scenarios seamlessly through a modern, unified technological offering. This reduces complexity for retailers so that they can focus on empowering their employees to deliver differentiated and personally relevant customer experiences. Key concepts of the solution are centralized dial-up management and multiple channels that include brick-and-mortar stores, e-commerce stores, and call centers. Dynamics 365 Finance and Operations for Retail supports both traditional Retail Point of Sale and Modern Point of Sale which can be used on mobile and tablet devices. Channel Management – As you set up your Retail experience, you'll have to decide how to define and configure your stores. They can be brick-and-mortar stores, online stores, or call centers. Each retail store can have its own payment methods, delivery methods, price groups, income and expense accounts, registers, and staff. After you create your retail store, you can create an assortment of products that you want the store to carry. You can also define store-specific prices and discounts that apply to products that are available in the store. Clienteling and Loyalty – Customers constantly need change. You must be able to quickly and effectively keep up with changes in buying habits and trends. This will allow you to attract new customers but also keep your existing customers happy. Therefore, customers have many options for getting what they want, when they want it, and at the price they want. To maintain customer loyalty, you can use personalized notifications and offers that makes shopping easier. Hardware and Peripherals – Retail Modern Point of Sale and Cloud Point of Sale can use a wide range of hardware peripherals. Both MPOS and Cloud POS offer multiple interfaces and deployment options to help you with your various business scenarios. The peripheral simulator for Retail includes a virtual peripheral simulator and a POS simulator. The virtual peripheral simulator primarily supports testing of scenarios that usually require physical POS peripheral devices. The POS simulator lets you test the compatibility of physical peripheral devices with Retail without having to deploy the POS client. Intelligence – Advanced analytics bring the power of machine learning to retail challenges and enable predictive, optimized, and personalized insights that help lead to growth and profitability. Retail lets you deliver visual reports on any device, whether it is online or offline. Monitoring and Diagnostic – Additionally, you can help customers identify products and services that meet their needs before the time of purchase. Retail lets you monitor sales and margin performance in real time across various levels of the organizational hierarchy as well. Merchandising – Before you can offer products for sale in your Retail channels, you must create and configure the products in Retail. You can create the products, define the product properties and attributes, and assign the products to retail category hierarchies. To make the products available to your Retail channels and add them to an active assortment, you must release the products to the legal entities where they are available. Store Operations & POS – You can make price adjustments to products, and you can also set up discounts that are applied to a line item or a transaction at the POS, in a call center order, or an online order. MPOS is a POS app for PCs, tablets, and phones. Sales staff can process sales transactions and customer orders and perform clienteling activities, as well as perform daily operations and inventory management on mobile devices anywhere in the store and also at PC-based registers. Cloud POS is a browser-based POS that can be started in any standard browser. Workforce Management – To be profitable in an environment where margins are decreasing, retailers constantly try to reduce their operational cost. For most retailers, the cost of retail staff is a significant part of the operational cost. Therefore, by controlling this cost, retailers can have a significant impact on their bottom line. Additionally, an empowered and productive workforce lends itself to improved customer experience. 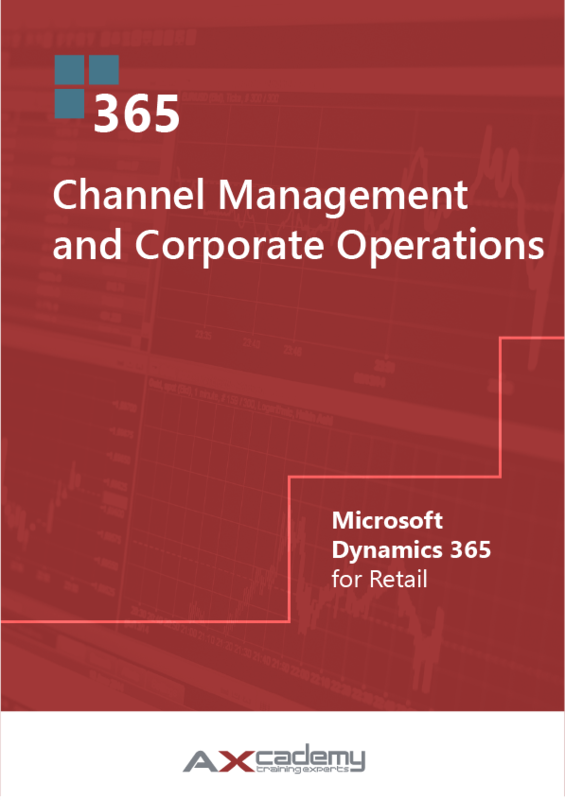 The above text is an excerpt from our training material Channel Management and Corporate Operations in Microsoft Dynamics 365 for Retail, available in our webshop.